Long Melford, Sudbury, Suffolk, CO10 9BA. 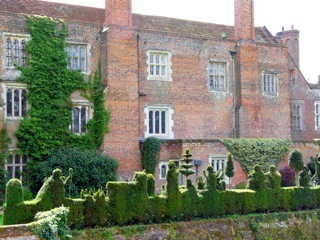 Kentwell Hall is a Tudor House which is still a family home. Some parts of the house are open to the public, as are the gardens and I suggest you look at their website for further details. I haven’t been there yet but I will. In the meantime I am indebted to Louise Taghi, the Office Manager at Kentwell for pointing out the astonishing Pied Piper Hedge they have there. (See I knew someone reads the Topiary in the United Kingdom Website). It was carefully created and maintained by the owner Mrs Judith Phillips.